-Purchase or borrow from the library either of the books, “Cooper’s Tale” or “Fly Away Home,” and use the discussion questions to explore why and how families become homeless. -Identify an organization in your local area that serves the homeless. Choose and complete a service project that helps its clients. -Using the questions, explore together as a group the reasons why families become homeless and why homelessness is harmful to children. -Visit a homeless shelter or the offices of an agency that serves to homeless to learn more about this issue in your local community. Students can research and develop their own project that serves the homeless. In addition to benefiting from taking part in these experiences, kids can earn scout patches as well. 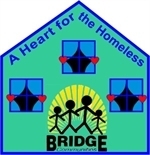 After the troop members complete the activities from the “What’s It Like To Be Homeless?” curriculum, troop leaders can order Bridge’s “A Heart for the Homeless” scout patches for $2 apiece from http://www.bridgecommunities.org. We hope these activities can answer some of the tough questions your kids may have about poverty and homelessness, and help them keep the homeless in their hearts. I forwarded this to my daughter who home schools and my daughter in law who is a teacher and girl scout leader. They are both very excited to explore these books and opportunities. Thank you Bridge Communities.